If you didn’t spend a couple of hours yesterday watching the opening keynote at Google I/O, you should have. Such events, ostensibly for developers, provide an excellent showcase for technology trends and the world we’ll soon be living in — perhaps longer if you don’t speak English, but soon enough. 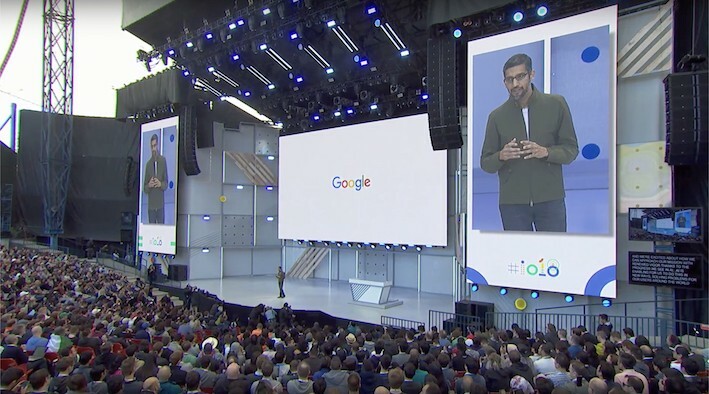 Among the wonders Google presented to us, courtesy of a Sundar Pichai who gave way to different product specialists, it’s clear that the road the company started down about two years ago with messages such as our AI beats competitors’ AI because we’ve been doing it longer, we put AI everywhere or we are rethinking ourselves as a machine learning company first were not idle boasts. The words AI, artificial intelligence or machine learning were constantly repeated in association with absolutely every product, each service, each moment. The change is so deep, so obsessive, that even Google Research has been renamed Google AI: all its research has to do with the incorporation of machine learning and artificial intelligence. In everything and for everything. 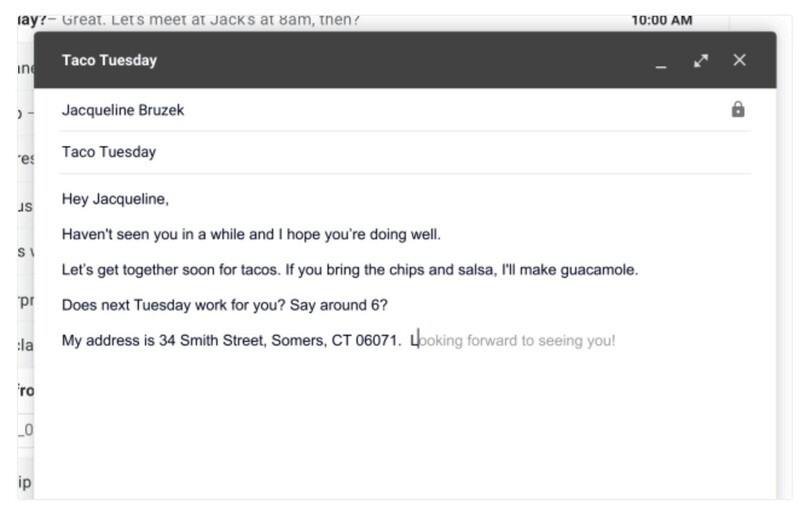 Among the novelties, a message writing assistant for Gmail. The idea of an assistant that writes your messages, proposing you complete sentences as you write, has been around for some time. You many already have experienced it: when I answer one of the two or three emails I receive every week about placing advertising or sponsored posts on my webpage, an offer I always politely turn down, I have verified that I can compose a complete message (about two lines of text) simply using a predictive keyboard, which suggests to me words I have used on previous occasions. Of course, one thing is a standard response to a repetitive theme and what we saw yesterday: the message above was more than 90% or 95% composed by an algorithm, with human input simply starting a sentence with a few letters. Among the suggestions are greetings and friendly farewells to proposals on what to wear to dinner, along with dates, time or directions. There is something disturbing about watching it in action: the machine is not only aware of how you usually address your subject, but it understands what the message is about depending on a word in its subject, knows the ingredients of a dinner with that main element, calculates what day you can dine with that person, suggests an appropriate time, and even gives your address! To be honest, what I found most disturbing about the exercise was that the message was to invite a female friend to dinner. I don’t know about you, but when I imagine the automation of tasks, I tend to associate it with work, with formal, functional issues rather than ​​writing to a friend: I write to friends in a different way, with another mentality… it is, for me, a task that surely, even if I could, I would not want to automate. Likewise I would not like to think that my friends write to me or answer my messages using AI, although there are events, such as birthday greetings, that depend almost exclusively on reminders that Facebook, LinkedIn and other networks tell anybody who includes me in their network. Another particularly interesting and, in many ways, futuristic example, is the possibility of having the Google assistant make phone calls for you to real people to make an appointment for a haircut or reserve a table in a restaurant. The conversations that Sundar Pichai used as an example of Google Duplex come from the analysis and training of the algorithm with thousands of hours of anonymous conversations, developed in a terrifyingly perfect way, with the assistant not only expressing itself as a person in all senses, with an indiscernible human intonation and even the use of particles of assent or waiting or making decisions on the fly. The real people on the other side, a hairdresser or restaurant owner with a rather limited command of English would have no idea they were not talking to a person. Those are borderline situations, although some might consider it disturbing: a call of that type, to request an appointment, is considered mechanical, and both parties would want it over with as quickly as possible, indeed we may do online anyway. But it’s certainly different to communicating with a friend. Such technology, as soon as it is reasonably deployed and popularized, will change social relations: millions of people will start to regularly use these kinds of assistants for these types of tasks and the people on the other end of the line will assume they’re talking to an assistant, and will probably change their way of expressing themselves, seeking greater efficiency and dispensing with certain formalities, or even using another assistant to converse with ours. This is one of those moments of truth we are increasingly seeing: Google has shown not only that its conversational technology, its AI and its machine learning is well ahead of the competition — which we can verify by asking Siri, rather than Google, on our iPhones and noting the quality of the answers — it has also showcased realistic options for use, reasonably mature technologies that support extremely versatile cases of use, everyday situations of all kinds, situations that many companies may use to propose a service no longer cheap, but possibly, a better service, more predictable and with fewer mistakes. Automation no longer means to act automatically, but to solve a complex problem, with machines that have been previously trained using thousands of similar situations, and for which they always have the perfect answer, the precise word, the ideal decision. Do we want assistants to automate tasks we consider mechanical or boring? Without a doubt, yes. Do we want to automate our relationships with our friends, to solve those eternal WhatsApp conversations to meet for a drink? There I begin to have my doubts… I would surely value tools for some things, but I think I prefer to continue believing I am talking to my friend, not my friend’s digital assistant. But maybe in a few years things will have changed and we’ll have developed a whole new set of social protocols for those occasions. I don’t know if this is road to heaven, but it is here to stay. If you did not see Google I/O, seriously, take a moment. It’s worth it. If what you see disturbs you, don’t worry, it’ll soon be the new normal. It’s here, already available, it can be used, it is no longer science fiction, and you will experience them sooner rather than later… who knows, maybe in your next dinner invitation!